When it's too hot to move, let alone blow-dry, curl, or straighten your hair, it's time to let the creativity flow! With a few twists, bobby pins, and very little skills, you can take your hair strands to next-level of chicness. I don't know about you, but in the summer nothing feels better than having my hair up and out of the way so here are my top 5 favourite trends. They all look doable, so switch things up a little and have fun with your beautiful summer hair! Braids never go out of style, they were big in spring and they are here to stay this summer. Whilst this looks a bit complicated to accomplish, you will all agree with me that these are gorgeous and perfect for that festival, wedding or even that bbq you're attending. These work better with medium-length to long hair, so if you separate your hair in two ponytails, braid each section and pull them across your head, this is totally achievable. And, if you are looking for something a little more French (get it? ), check out this tutorial (here) by Little Miss Momma for the perfect French braided crown; I love the result! It should be no surprise that this hairstyle made its way to this list. We all have our lazy days (aka bad hair days) where our hair just doesn't seem to want to help us out. Pushing back all hair to the top of my head and rolling it into a knot couldn't be easier and I can probably get it done with my eyes closed. I love how it instantly makes you look more polished and how it brightens up your face. Wear it with a bold lipstick for an outing or with killer long lashes for work, and of course pick your favourite earrings to top it all of. This is how we all wish to look on holiday. Plenty of sea salt spray and the sun provide beautiful carefree waves. Whether you want to leave your hair down, with a braid, or in a high bun, wavy hair can do you no wrong. And how great does the short wavy bob look?! Make like these beauties and work nonchalant hair and beauty look beach-side. Team this hairstyle with a flowy maxi dress or skirt and over-sized shades and you are sure to look like a million bucks! This is as simple as 1, 2, 3 and all you will need is a few bobby pins. Twist your hair, and slip your bobby pin underneath to secretly pin back your strands. Pretty girly hair is what you are left with, and I personally love wearing this type of hairstyle with a cute summer dress and for work! And last but certainly not least, these amazing accessories we should all be reaching for this summer. 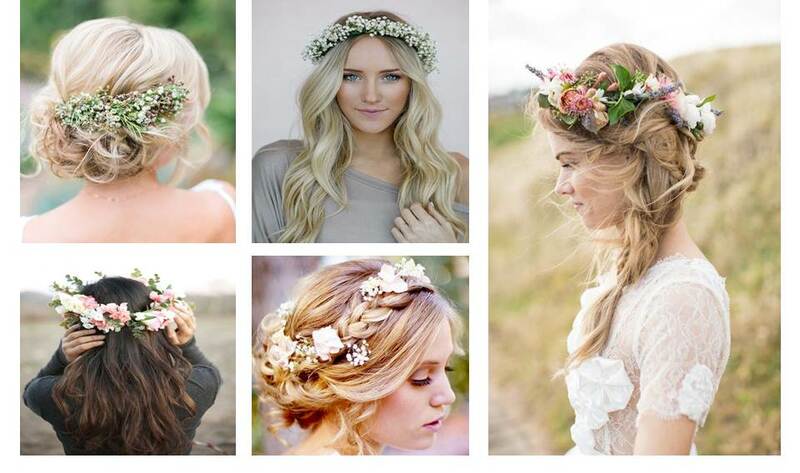 Flower crowns scream festivals and summer parties, whilst chains are boho chic, perfect for that dreamed beach wedding! I would wear these with my favourite off-shoulder dress and that's two trends in one go! I knooooow these may be a little out there for some, but don't they look incredibly beautiful? I bought a few on Asos recently (see here) and I can't wait to wear them on my upcoming holiday! Tell me, how will you be wearing your hair this summer? Thanks for reading beauties, and until next time! *photos are from Pinterest and do not belong to me. Collages made by me. Love the boho crown braid hairstyle :) It's so chic and stylish! Love these, the top knot is my go-to but I need to master the first braid! I loved the pictures! I like braids, but I am not so talented doing some, just a simple one, Wavy hair is my normal hair, and I like to pin it back as well! Very nice inspiration here! Mine too :) Thanks for visiting! The look of the BoHo crown braids is so effortless, but then you are sitting in front of the mirror, arms hurting, and you realize they just LOOK easy, but actually aren't. Hair accessories have been all the rage, and I'd LOVE to wear them, but the other day, I tried on a head chain and it was extremely loose on my head (???) Ah, I guess I'll stick to top knots and braided crowns. :') Loving these inspos, Pam! Wahhh what a beautiful inspiring hairdo's and tricks!! I love the Boho Brown Braids, not sure I'll be able to achieve all the looks but, I would sure love to give them a try. Dicas maravilhosa amei los cabelos, bom final de semana. Everything is so cool! I dont even know what to choose ... Cool post! I love braids! Great post! Love all of them so much!! <3 need to start doing more with my hair just get fed up of it down in the heat though!! lovely post as usual!! Great inspirations, I love the braids and curls! Bonitos acessórios para o cabelo! I have a long hair, longer than a waist-length... so I always go for braids. Maybe that's why of all this summer hair inspirations, my favorite is the above picture--the braids! wow! what a beautiful hairstyle.. I love beach wave hairstyle!♥ great inspiration! Oh i love the boho chic hair. Wow these are so beautiful! I wish my hair had the ability to look that good even once a month! Definitely want a flower crown when I get married some day! Love this post! Well just before summer I have cropped my long brown hair to a long bob with ombre honey colour and a week ago I went even shorter, Rihanna short lol :) and I love it. I love this amazing look, Pam. Beautiful and inspiring selection. I'm always looking for new things to do with my hair! I love, love, love the beach wavy hair styles - they are gorgeous and I will definitely be recreating that look. I LOVED THE HAIR STYLES! Amazing post! Crown braids are my favorite ones however hair accessories such as hair chains are really trending right now! The vrown braids are so pretty and elegant. I like it.